A Chinese boy learns a craft and shares a humble gift. Nine-year-old peasant Hu Wan gardens with his grandfather beyond Beijing’s Forbidden City in this story set “many centuries ago.” Each year, Hu Wan’s grandfather cultivates a special gourd—shaping and carving it to create an intricate, decorative cricket cage. This year, Grandfather allows Hu Wan to shape the gourd, and when Grandfather gets sick and only weakly recovers, Hu Wan must carve the gourd as well. He creates a simple cricket cage in the shape of a sleeping dragon, and a cricket’s chirps fill the dragon with beautiful music. Could this lowly dragon, with its simple song, bring peace to a young, bereaved emperor? Inspired by a display of cricket cages, Young attempts to create a parablelike tale from imaginings of ancient China. Indeed, descriptions of the cage-crafting and the author’s note with cricket facts are the most compelling parts of this text. The story itself winds desultorily from one romantic stereotype to the next, with no redemption from the art. 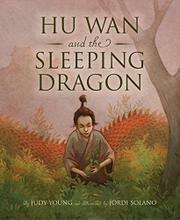 Solano’s illustrations caricature rather than characterize—a palace guard appears to be modeled after stock Asian villain Fu Manchu—and they omit critical plot details: despite textual references, images of the sleeping dragon do not include visible breathing holes, raising the question of how a cricket would actually survive inside.